What I've learned in the first year of my career! Tomorrow officially marks my one year anniversary at my first career job! I can’t believe how fast this time has gone by and I feel so incredibly blessed and grateful to be in this position. My after graduation job search was stressful but all of the cards finally aligned when I was offered a marketing coordinator position at an amazing nonprofit! Though the position required 2-3 years work experience, I felt strongly that I was qualified to do the job well and I was finally given a chance. I’ve learned a lot within the last year and have probably gone through more experiences than most during my first year, from a transition to a new CEO and a big office move to a state budget crisis. At the end of the day, all of my experiences during this first year have helped me grow tremendously in not only my skills but my confidence. I’m so excited to see what year 2 has to bring! Here are 4 key things that I’ve learned in the first year of my career! If you’re anything like me, beginning your first ever career job can be pretty intimidating. Don’t waste time worrying about being the least experienced in the room, just keep reminding yourself…”Hey, I made it in the damn room”. You’re going to run into so many different personalities in the workforce, some that you’ll work very well with and some that you just won’t. Always remain pleasant with a “yes, and” attitude and you’ll be just fine. Utilize your bosses as mentors! I have the most amazing bosses who are always willing to help me out, answer questions and lend some advice. As a newbie, I know that I can soak up so much knowledge just by being around them that I’ll be able to use throughout my entire career. Don’t get too comfortable. In the workforce there are always changes happening. Coworkers that you’ve gotten close with will leave, deadlines will get pushed up unexpectedly….you might even move offices! Be ready open and ready for anything, but most importantly just enjoy the journey. 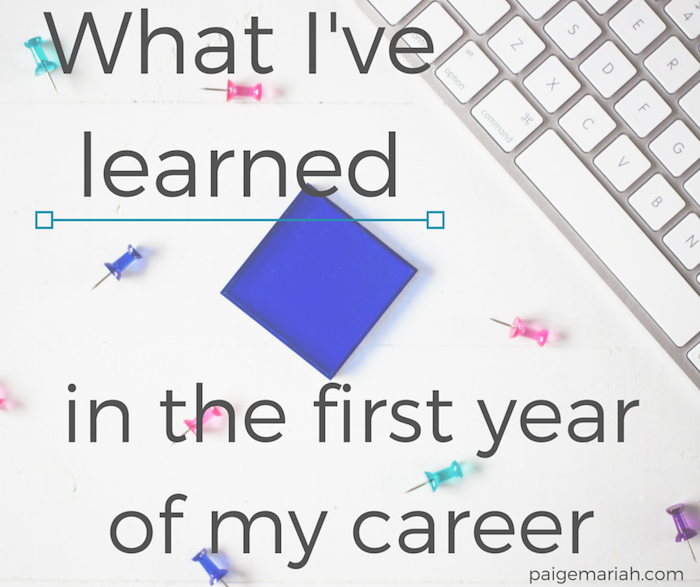 What was the most important thing that you learned during the first year of your career? Share in the comments!